Simone Marcato reports on the 2017 multinational Blue Flag exercise organized by the Israeli Defense Forces at Ovda Airbase, Israel. From 6 until 16 November 2017, the Israeli Air Force’s Ovda Airbase hosted the third edition of the biennial multinational military exercise Blue Flag. 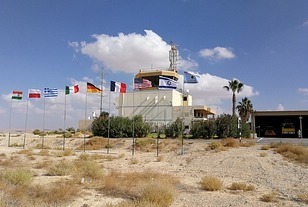 Located in the Negev desert, in the southern part of Israel, Ovda is a military airbase and civilian airport in the Uvda region. The airport is about 60 km north of Eliat, Israel’s harbor city on the Red Sea, and a 4-hour drive away from the city of Tel Aviv. With the participation of eight countries, 70 aircraft, and around 1000 military personnel involved, Blue Flag 2017 is the largest multinational military exercise to take place in Israel to date. On November 8th, journalists and media photographers were able to attend the Media Day at Ovda Airbase organized for exercise Blue Flag 2017 (BF 2017). Besides the host country, the Israeli Defense Forces of course had a major role in the exercise, participating nations included for the first time France, India and Germany. In fact, Blue Flag 2017 marked the first-ever visit of German warplanes to Israel. Along with the three newcomers, four more nations that also had attended past Blue Flag exercises took part again in 2017, namely Italy, Greece, Poland, and the USA. The aircraft deployed and units involved in BF2017 are listed below, roughly half of the 70 aircraft were Israeli Air Force F-15 and F-16 fighters. Furthermore, Israeli Air Force support assets included a single Gulfstream G550 Nachshon-Shavit Special Missions Aircraft and some UAV Helicopters from 122 Squadron with electronic warfare and reconnaissance roles, while on the ground Patriot surface-to-air missile systems of the Israeli Air Defense Command were deployed for the first time in this kind of exercise, as well as Israeli special operation forces. The operational and logistical challenges during the preparation and the execution of the exercise were unprecedented for the Israeli Air Force, because of the increased size of the event especially compared with the previous two editions hosted in 2013 and 2015 with only 4 and 5 participating nations respectively. To achieve the desired objectives, the exercise’s command center was located at the airbase to have centralized management of the exercise and all the participants had been deployed to the large military side of Ovda Airport. Throughout the first week, the aircrews, commanders and technical personnel acclimated themselves to the base and in the operating areas. From the beginning of the second week, the participants started working and flying together in complex scenarios and coalition air operations. At the base, each participating nation had its own working area, but all the briefing and debriefing sessions were carried out together in a dedicated building called BF Complex to benefit cooperation. With the same aim of enhancing cooperation between the aircrews, the leader of the air operations was changed every day. The key component of the exercise was the GCU (Ground Control Unit) that had real time control of the exercise. Member of the GCU, Major E. D. explained: "Our priority is guarantee safety during the entire BF 2017 duration. The first and most important thing is to carry out a safe exercise. As you can see on the geographical map, Israel is a small country, but with very busy airspace occupied by civil air traffic routes (including numerous VFR flights), military training areas, UAV designated areas, and with another big problem being the bird migration routes. Everyday dozens of both civil and military aircraft are in the air simultaneously, and we have to work with maximum coordination with the civil air traffic controllers (ATCs), together monitoring the airspace. But, in any case and at any time, the Israeli Air Force is the higher authority in control of the Israeli airspace. Due the complexity of the exercise almost the entire south part of the Israeli airspace is closed for 3 hours daily, and, with the aim to avoid incidents and problems with civil air traffic, a No Fly Zone (NFZ) has been created in the skies above the Negev Desert, with the exception of a narrow and long airspace corridor next to the border with Jordan, in which the commercial flights to Eliat Airport are diverted along from their normal navigation routes. Moreover, every day during the 3 hours dedicated to the military air operations, civil aircraft are not allowed to land at the civilian Ovda Airport. Inside the NFZ there are no limits in terms of speed and altitude for the fighter jet pilots and supersonic speeds can be reached." Blue Flag 2017 involved large multinational flights in a COMAO scenario: Typical air operations included Defensive Counter Air (DCA) missions, electronic warfare, low-level commando landing missions, GCI (Ground Controlled Intercept) tactical cooperation with the blue forces, Blue versus Blue training, CAS missions and SEAD (Suppression/Destruction of Enemy Air Defenses) operations. Normally, the flying activity saw two mass launches per day, with 1,5 hours of operational flying for each wave. Night operations had been flown too. 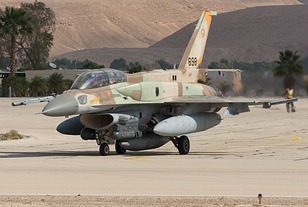 Particularly during DCA sorties, the participants flew against the 115 Squadron "Flying Dragon", the Israeli Air Force’s "aggressor" squadron, which simulated enemy air forces with its F-16C Block 30 Barak. Beyond flying as Red force, the unit's personnel also simulated opposing forces, including surface-to-air threats like SAM batteries and MANPADS (Man-Portable Air Defense Systems) and performed electronic warfare attacks. The participants also faced the Patriot air defense system belonging to the southern battalion of the Air Defense Division, which simulated threats (not live firing missiles during the exercise). In the two-sided Blue versus Blue sorties, the participants were divided into attackers and defenders and flying against each other, showing their own ways of doing things, sharing their tactical experience and air warfare doctrines. The Support Operation Commander, Lt Col. R. P. said: "Looking at the current worldwide political situation it is paramount to have the opportunity to gain mutual experience with our Allies and befriended countries, knowing each other and sharing our knowledge about several kinds of operations. The goal of the Blue Flag training exercise is to simulate extreme combat scenarios and coalition air operations as realistically as possible, with the aim of enhancing multinational cooperation, maximizing and improving the combat readiness of all air forces involved with the realization of experience gained from international exercises. This is also a unique opportunity for unit commanders and pilots alike to fly missions within a large multinational coalition, something that has become normal in actual military operations, especially in the Middle East. Our aim is not to win or lose, but to learn."